WH40 ELEMENT Variable Auto-Darkening Welding Helmets. 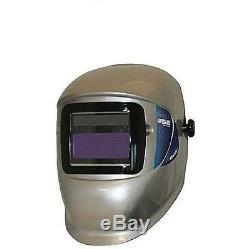 Element Series W40 Welding Helmet is solar-powered and has economical lens for the consumer welder. Welding helmets lens shade: #9 - 13. Welding helmets suspension: Element headgear. Type: Series W40, variable auto-darkening filter. Size: 110 mm x 90 mm cartridge. Window size: 1.65-inch width x 3.77-inch length. Meets ANSI Z87.1 and CSA compliant. Rugged, light-weight welding shell, only 6 oz. Is ideal for all-day wear. Shape of the shell is designed to eliminate hot ambers from sitting on the shell, thus protecting the welder from injury. WH40 ELEMENT Variable Auto-Darkening Welding Helmet, Silver, Shade 9-13. Features an economical lens for the consumer welder. Features variable shade 9-13, sensitivity and delay adjustments. The item "NEW WH40 ELEMENT Variable Auto-Darkening Welding Helmet Silver SOLAR POWER" is in sale since Thursday, March 6, 2014. This item is in the category "Business & Industrial\CNC, Metalworking & Manufacturing\Welding & Soldering Equipment\Welding\Welding Protective Gear\Welding Helmets". The seller is "supremesafetyinc" and is located in Richboro, Pennsylvania. This item can be shipped to United States, Canada, United Kingdom, Denmark, Romania, Slovakia, Bulgaria, Czech republic, Finland, Hungary, Latvia, Lithuania, Malta, Estonia, Australia, Greece, Portugal, Cyprus, Slovenia, Japan, China, Sweden, South Korea, Indonesia, Taiwan, South africa, Thailand, Belgium, France, Hong Kong, Ireland, Netherlands, Poland, Spain, Italy, Germany, Austria, Israel, Mexico, New Zealand, Philippines, Singapore, Switzerland, Norway, Saudi arabia, Ukraine, United arab emirates, Qatar, Kuwait, Bahrain, Croatia, Chile, Colombia, Costa rica, Dominican republic, Panama, Trinidad and tobago, Guatemala, El salvador, Honduras, Jamaica, Bahamas, Viet nam.